A richly detailed work which takes the listener on a tour of myriad architectures of sound. A tour of many changes and wonders, it captivates the listener’s rapt attention through its entire length. Tempos, textures and energies segue into something ever new before our delighted ears, and we soon find ourselves walking behind skies and dancing to architectures, just as the music commands. 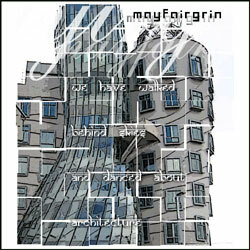 mayfairgrin is part of the Mannequin Oddio Media cooperative, which you ought to visit and explore. This is mayfairgrin’s third release on Webbed Hand Records. This entry was posted in Catalog and tagged Catalog, mayfairgrin, Releases by C.P. McDill. Bookmark the permalink.